After my sister took care of some business with the Title Company and Bank regarding buying the condo, we were able to go into the condo and do what we came to do...measure, photographic and plan. Her condo is really nice and think she'll fit right in. It's an adult community with lots of extra-curricular activities if she wants them. She now has a clearer picture of what to bring with her, what to sell and what she'll need to buy. We then spent the rest of the day with a friend of her's that lives in the area. The Friday Expo started at 1 pm for registration. 2 pm for the Keynote Address: by Arlene H. Eakle, Ph.D. 3 pm the Exhibit Hall opened and 3:30 pm the classes started. My first class was with Lisa Louise Cooke: How the Genealogist Can Remember Everything with Evernote! I've been interested in Evernote for some time but this was the first time it was explained what Evernote is and does and why I need to use it. I'm going to sign up today! Second class was with James L. Tanner: The FamilySearch Research Wiki: The most valuable genealogical resource on the internet. I've heard of the wiki before but was really impressed because Mr. Tanner explained how the wiki works and helps everyone. 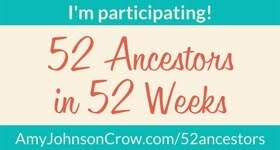 I'm going to look and see if my county has a wiki on the FamilySearch website, if not, I'll help with some information. Third class was with Timothy G. Cross: FamilySearch Global Initiatives. He went through the process of how FamilySearch provides records: image capture, digital conversion, preservation, online indexing and online access. Fourth class was with Ruth Ellen Maness: What Do I do Now? : Effective Tools for Pedigree Analysis. Two major objectives of family tree analysis: 1) that correct ancestral lines are established, and that all members of ancestral families are identified and placed within their own family unit. 2) identify, define and establish research goals = WHAT DO I DO NOW? We were on the road by 7 am. I drove for the first two hours then we switched. I took a nap and woke up when I could feel my sister fighting the cross winds while driving. They were really strong. We stopped at Chiriaco Summit located 30 miles east of Indio on the I-10 Freeway. We had breakfast then walked next door to the General Patton Memorial Museum. It's a military history museum with exhibits ranging from World War I through the Iraq and Afghanistan Wars. During World War II our father was a tank commander under General Patton at the Battle of the Bulge. We both enjoyed every minute. Kind of brought us closer to him. I decided to continue the drive home. We went about 35-40 miles west on the I-10 watching the dark clouds because my husband had said it rained the night before and we would probably run into it coming home. The cross winds were strong here too. I moved over to the slow lane in case I needed to get off the freeway. We were just entering the Palm Springs area when I noticed we were coming up to an off ramp. Suddenly, the sun was blocked out and a wall of sand and dirt engulfed us. Everyone either slowed way-down or was trying to stop before running into someone in front of them. OMG! It was the scariest thing I ever encountered while driving. I couldn't see the vehicles in front, behind or beside me. They were all GONE. Just a blanket of sand and dirt swirling around us, like a movie. I decided to inch our way off the the freeway and onto the shoulder of the off ramp. A large truck was already there so we just sat behind it and caught our breath. I still had the air conditioner on and the car was running. We could barely make out cars and trucks inching their way on the freeway or coming off the ramp we were sitting on. Several cars stopped behind us but then moved on. I pulled out my BlackBerry and started using the video camera to capture what we were seeing because no one would believe how bad it was. I also started posting on Facebook where we were and what we were seeing. It's the first time I actually used social media to get the word out about a situation that was happening at that moment. I eventually turned off the car and we sat and watched. Do we get back on the freeway (NO)? Do we get off the freeway? Do we just sit there and pray no one plows into us from behind? As I was looking at the traffic I noticed a very large piece of cardboard (wasn't sure what it was) being carried on the wind right toward us. It was spinning and spinning in the air coming closer and closer. It hit the car in front of us then splintered off and a large piece came right toward my car. It hit with such a BANG I first thought either the windshield or my driver door window had shattered. It glanced off the driver's outside mirror holder then slid across my driver window leaving a long scrape mark. That was the big BANG we heard. When I turned to look, there were large pieces of wood wedged between the window and the rubber seal that goes around the window. We were so shook up we couldn't move. We said we need to get off this ramp so we followed the line of cars off the freeway and made it to a Shell gas station and mini-mart. Getting out of the car and making a run for the building was hard. We were getting pelted by sand, dirt and debris. The wind outside was deafening roar. All we could do was shake our heads in wonder. The woman who was in the car ahead of us finally came in too. We all compared our experiences and stated how lucky we all were, no one was hurt, just badly shaken. Some of the sand lifted and we could make out a Denny's restaurant nearby. So we ran to the car and carefully made our way over there. We decided not to park under any trees, parked on the other side of the building and ran inside. There were others there who were caught same as we were. We decided to order something to eat the see if the sand cloud was going to continue blowing or to clear. We must have been there about an hour. As we watched from the window I could finally see cars more clearly exiting the freeway and my sister could see traffic moving on the freeway itself. We decided to go for it and continued West. All the way home we kept talking about what we saw, and felt. We had sand and dirt in our hair, scalp, ears, clothes, shoes and between our toes. We could even “taste” dirt. My windshield looked and felt like it had been sand blasted. Very pitted and a mess. When I got home I unloaded the car in the living room and headed for the shower. It had been a very l-o-n-g day. So glad to sleep in my own bed. NOTE: The very next day I was driving down the freeway to go shopping with a girlfriend telling her the story when a rock came flying at us and left a bulls-eye hole in the windshield. I think the car is cursed. Allstate, here I come. Your little truck has gone across the country twice now, plus up to Canada. For all those miles I'm sure your car has done well. But I still think it's time to trade it in for one with better luck!